Schema locks are not showing up in the Oracle Instance when viewed using ArcCatalog. Data is being using in different applications but for some reason I'm not able to view the locks as the data owner/geodatabase administrator on Oracle instance. Does it need any specific permissions assigned on Oracle for GDB Admin to access the locks? Because of other items being grayed out, I assume that you are not connected as the sde user or an administrator or owner to that database. Clicking the Refresh button updates the list with the most current connection details. 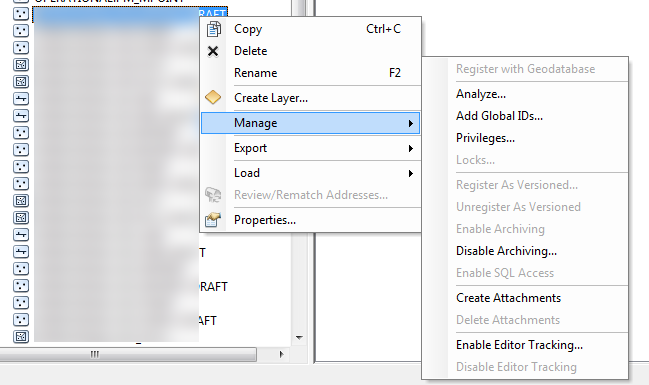 Start ArcMap or ArcCatalog and connect to the geodatabase as the sde user. Right-click the database connection in the Catalog tree, point to Administration, click Administer Geodatabase, then click the Locks tab. The Locks list opens, and you can see all locks on all objects in the geodatabase. Contact the user who holds the lock that needs to be released and ask him or her finish the transaction and disconnect from the geodatabase. If the person is gone for the day and the lock needs to be released immediately, you can disconnect the user. Caution: Use caution when disconnecting users. Esri recommends that you avoid disconnecting active sessions, especially if the connected user is in the process of editing. You should only disconnect users to drop locks if a session was left open even when not being used (for example, over the weekend), if a session is orphaned and locking an object, or if a deadlock situation occurs. If necessary, right-click the lock and click Disconnect User. The sde user must be a super user to disconnect users. Not the answer you're looking for? Browse other questions tagged arcgis-desktop esri-geodatabase oracle schema-locks or ask your own question. Why does the File Geodatabase that I created not appear to any other users on the network? Importing XML workspace file without losing z and m parameters? Understanding schema locks in File Geodatabase registered to ArcGIS Server?